Mural artist Saner Edgar recently made his way out to Morocco to paint a new piece for the Jidar Urban Art Festival. The Mexican street artist worked away a large scale piece featuring one of his vibrant characters pouring a couple cups of tea beautifying the city of Rabat. Street artist Saner has been painting around the globe these days and recently landed back in the United States where he was invited by the Mural Arts program to create a new mural in Philadelphia. His latest piece entitled “Philos & Adelphos” (Greek name of Philadelphia), displays a couple who are dressed up with masks and traditional Mexican outfits embracing one another. Urban Nation recently kicked off their ongoing art program with a roster of artists curated by the Jonathan LeVine Gallery. One aspect of the event features artists who create window installations in Berlin and the ones invited this time did just that. 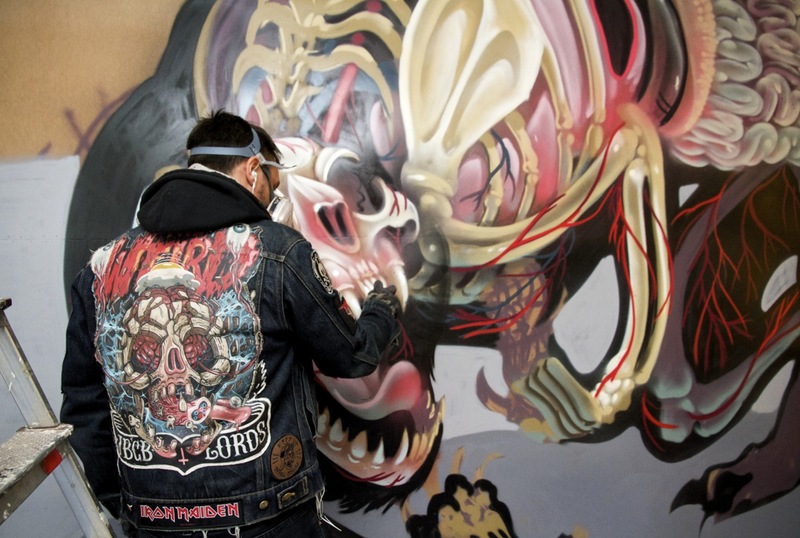 Take a look at some in progress photos as Dan Witz, Jeff Soto, Nychos, Olek and Saner created their own pieces to be displayed in the windows of the building as well as works for the group show.